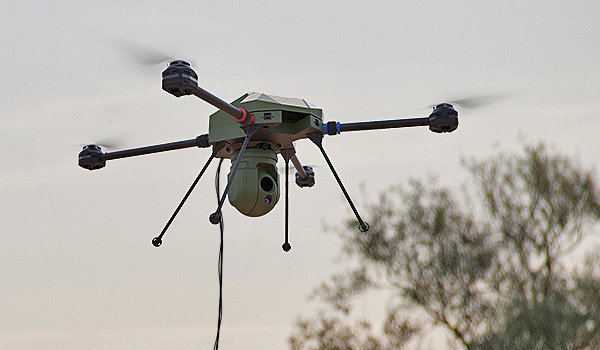 Designed for ISR applications, The Hawker Q800X is a versatile platform that can carry a wide range of payloads, from basic EOIR to CBRNe payloads. It provides real time situational awareness on the battlefield and is directly connected to the C2. The Hawker Q800X is equipped with a bottom plug and play connector to attach payloads up to 1Kg. 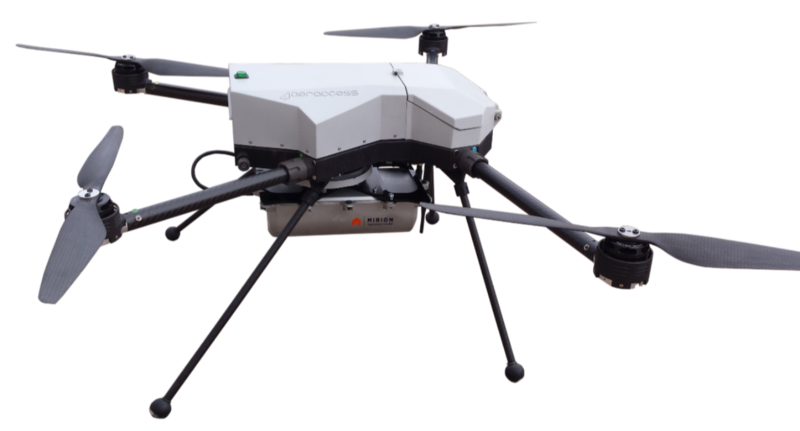 AERACCESS has developed a series of payload compatible with Hawker Q800X. Payload can be customized to fit special user requirement. 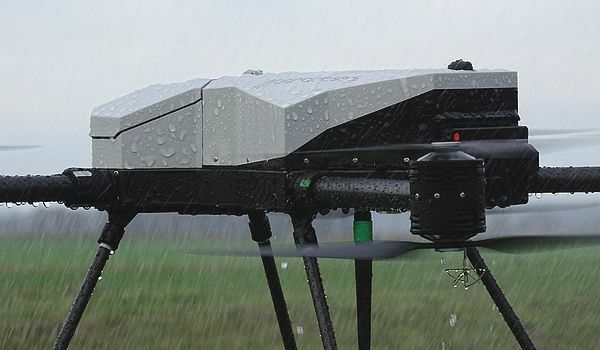 The Hawker Q800X is an all weather platform, ruggedized IP65 that can withstand rain upto 10 mm/h. It is used in heavy rain conditions, snow, fog and desert conditions. Designed to resist harsh weather conditions, the Hawker Q800X resists to wind conditions up to 70 kph and gusts rated 90 kph. The payload has also been designed to work in strong wind conditions. 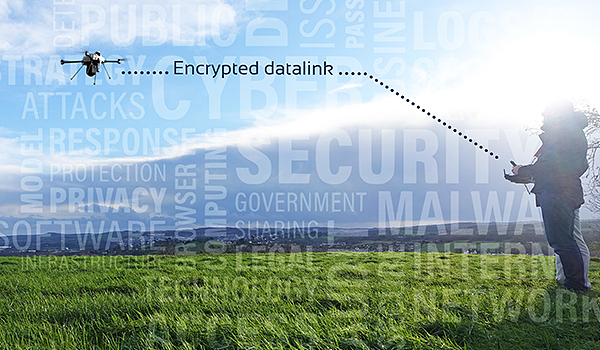 With its encrypted AES 256 datalink and video transmission, the HAWKER Q800X is resistant to cyberattacks. It can also operate in GPS-denied environment in manual mode thanks to its intuitive operator interface and ruggedized control tablet. When flying persistently for several hours is necessary, the Q800X can be tethered. The battery is replaced by the on-board tethered module which allows continuous tethered flight for several hours. The drone can swith to non tethered supply by using a standard battery pack. The Hawker Q800X integrates the light-weight MIRION Spir Explorer sensor to provide real time mapping for radiological detection, measurement and identification of nuclide. Applications : environmental surveys, military reconnaissance, Radiological Dispersal or Exposure Device (RDD or RED) detection, hospitals/industry fire hazards, nuclear power plant emergency response. 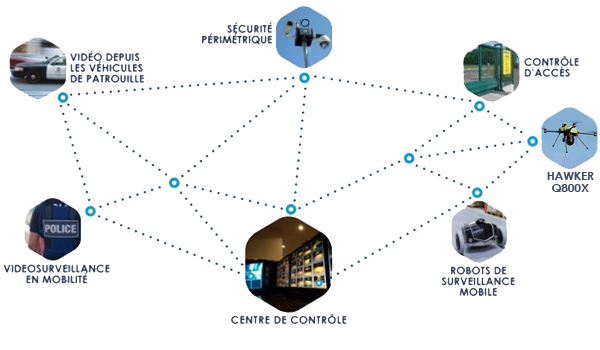 The Q800X provides a MESH network and fully integrates safe city smart programs. 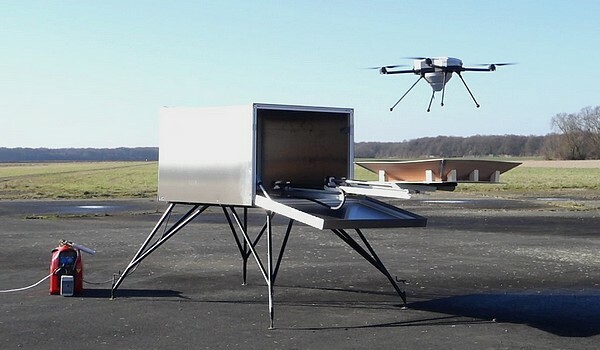 The UAV can act as a relay antenna during disaster management, providing secured network facilities for ground and air operations. 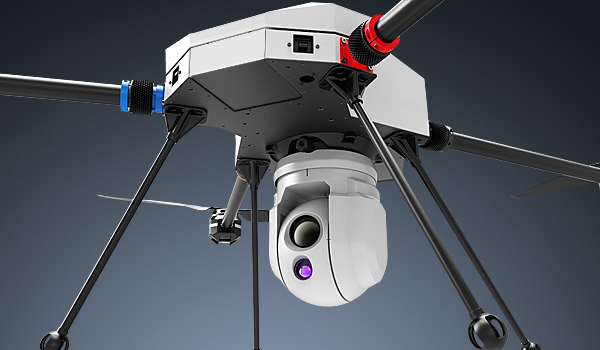 The Hawker Q800X is available with front standard payload integrating EOIR and laser capabilities. 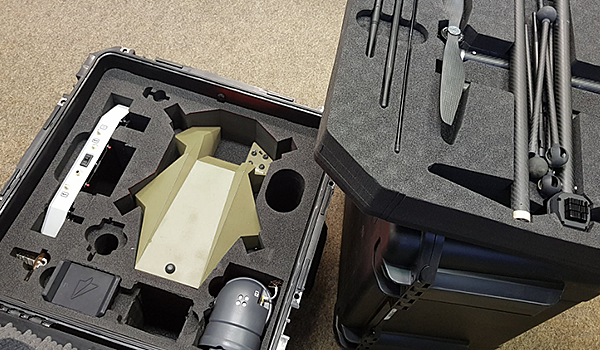 The bottom space under the platform is available for additional payloads, such as CBRNe, disrupters, carrying UGS, or any specific sensor. The front payload is detachable without any tools. The Hawker Q800X has an all integrated parachute deployment and safety system. It has a fully indepedant radio link and is powered by a safety battery. 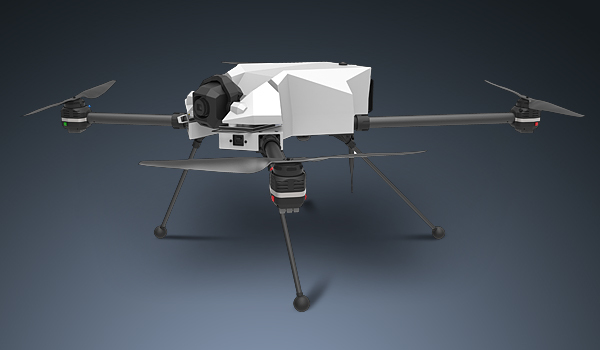 In case of failure from the UAV, the parachute will automatically deploy, and can also be deployed manually by the end user. All parts of the HAWKER Q800X are detachable and assembled without any tools. Maintenance purposes are simplified as any part of the system can be replaced easily. Batteries, motor arms, payloads are all swappable.